It’s a familiar stereotype by now: College graduates so burdened by their mountain of debt that they’re living in their parents’ basement, unable to take the next steps into adulthood. Except that it’s not quite accurate. It is true that student loan debt has ballooned since 2003. Back then, borrowers in their late 20s held about $5,000 in student debt on average, according to data from the Federal Reserve Bank of New York. In 2015, those loans averaged about $11,000. But at the same time, young people lowered their holdings of every other major type of debt: credit cards, auto loans, mortgages and home equity loans. The result, according to the New York Fed, is that millennials have less debt overall now than they did in 2003. The chart shows the total debt of people who were between the ages of 20 and 70 in 2015 compared to people who were between 20 to 70 in 2003. The decline in debt is pretty modest for borrowers in their 20s, but it picks up for people in their 30s and 40s. 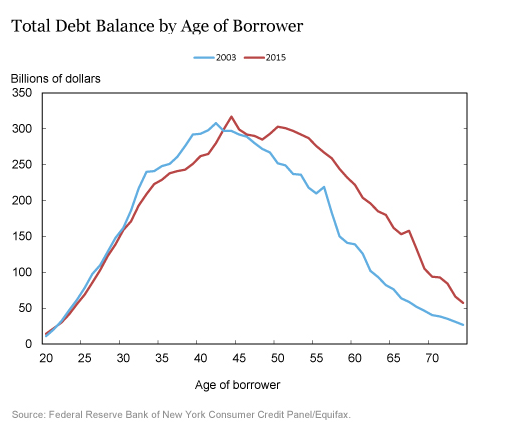 Which brings us to the next mind-blowing part of the New York Fed’s research: It’s not young people who are building up all the debt. It’s old people. 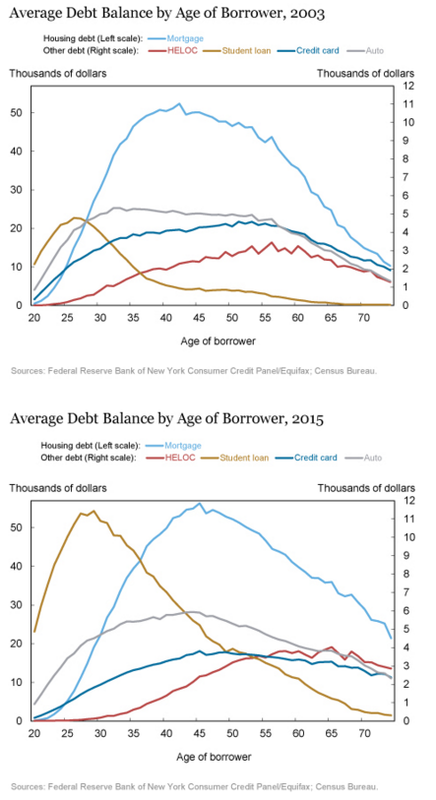 Look at the chart again, and you’ll see that older borrowers, starting at about age 45, hold significantly more debt than they used to. The New York Fed’s data shows the increase in average debt per capita spans every category except credit cards. Older borrowers even hold higher student loan balances than they did in 2003. The New York Fed calls this trend “ the graying of American debt. ” Part of the shift is simply due to an aging population. Baby boomers are now reaching retirement age, which means that there are simply more older people. Those who took advantage of the lax lending standards in place during the early and mid-2000s are still carrying that debt with them. In addition, many of these older borrowers -- who can boast long credit histories -- were more likely to qualify for new loans as underwriting standards tightened following the 2008 financial crisis. For young borrowers, the reverse occurred. Saddled with growing piles of student debt, they either did not qualify for or did not apply for other types of loans. Student loans are more onerous than other forms of loans because they cannot be discharged in bankruptcy. So there are good reasons for college graduates to be living in their parents’ basements. But the data suggests the hurdle to leaving may not be as high as they thought.